In Making It Explicit (1994) and Articulating Reasons (2001), Robert Brandom has introduced a semantic conception called Inferentialism. Inferentialist semantics determines the meanings of terms and actions by describing their inferential use in the language-game of giving and asking for reasons. Brandom’s domain is primarily the philosophy of language and not argumenta­tion theory. I will just give a rough sketch of the inferentialist idea and draw some consequences for our field: argumentation theory. Following Wittgenstein, Brandom characterizes his inferentialist approach as “an attempt to explain the meanings of linguistic expressions in terms of their use.” (Brandom 1997, 153) However, this slogan is not specific. More specific for Inferen­tialism is the idea that it is a particular kind of use that is crucial for the meanings of linguistic expressions: it is the inferential use of these expressions in the language game of giving and asking for reasons, i.e. the use of these expres­sions in contexts of argumentative reasoning. It may be confusing that Brandoms speaks of “inferential use” and “inference”, since these terms are sometimes identified with “deduction” or “formal entail­ment”. Brandom, however, does not follow deductivism, but pragmatism. Formal inference is only one case of inferring. Brandom also speaks of con­cep­tual, material and practical inferences. His concept of “inference” includes all kinds of regular connections and relations between linguistic expressions – and between linguistic expressions and practical conse­quences, i.e. actions. This concept of inference is open for many types of argument and could even be applied to regular connections between “meaning­ful” non-linguistic activi­ties, as long as these connections and relations can be judged in a normative dimension of correctness. Actions, linguistic and non-linguistic, are significant insofar as they follow from and are followed by other actions in a way that it can be understood as correct or incorrect rule-following. Instead of being too tight, Brandoms conception of inference may now appear as too broad for the purpose of explaining meaning and argument. This would be the case if Brandom had not restricted his focus to the inferential use in a particular language game, the game of giving and asking for reasons. In every kind of practice, language game or communication there are regularily connected, significant moves. Infe­rence is everywhere. But, according to Brandom, it is only the language game of giving and asking for reasons that discloses what the meanings of these moves are. The reason is that in this language game we do not only perform, understand and practice inferential moves, but also explicitly judge and mutually control the correctness of these moves. Whatever practice we perform, whatever game we play: as soon as the correctness of some move is called into question this game may shift to the game of giving and asking for reasons. The game of giving and asking for reasons is the game of argumentation or argumentative discourse. Moves in a language game can be judged as correct or incorrect und such normative judgements belong to the game of giving and asking for reasons. If I judge a move in a game as correct, the interlocutor is entitled to draw consequences from that claim. He may also ask for reasons why I claim this move to be correct. In this case I am committed to give reasons or withdraw the claim. Now, Brandom offers a conceptual frame in which this normativity of inferring and mutual judgement can be explicated. Inferentialist semantics is embedded in a kind of normative pragmatics that delivers a vocabulary to describe the normative dimension of social practices and language games. The essential concepts of normative pragmatics are com­mitment and entitlement. Every move in a language game establishes particular constellations of commitments and entitlements among the participants. And the participants keep score of these normative statuses which they ascribe to each other. In some respect, Inferentialism resembles well known theories, like Speech Act Theory or Dialogical Logic. For instance, Dialogical Logic determines the meanings of logical connectives by means of dialogue-rules. The proponent starts, for instance, with claiming “p and q”. Now, the opponent is entitled to attack p or q according to his choice. The proponent, then, has to defend the attacked assertion, say p, by giving reasons for p. If he fails, the proponent has lost the dialogue-game, if he succeedes the opponent may attack the other assertion q. If the proponent is able to defend q by reasons, he has won the game. These rules may explain what the meaning of the word “and” is in the claim “p and q”. Suitable dialogue-rules can also be explicated for the other connectives like “or”, “not” and “if, then”. The meanings of these words can be explained in terms of the rules of their use in a regulated dialogue-game. Another example is given by Speech Act Theory. The rules that John Searle has explicated for the speech act of promising are well known. These rules include permissions and obligations for speaker and listener. And these rules are not only supposed to be rules for a happy performance of that speech act. At the same time these rules figure as semantical rules for the correct use of the word “promise”. What this word means is explicated in terms of the rules for performing the corresponding speech act. And the same counts for all the other classes of performative verbs. In a sense, Brandoms approach can be seen as a generalisation of this explana­tory strategy. What Dialogical Logic has done with respect to the logical con­nectives, and speech act theory has done with respect to perfor­mative verbs, could perhaps be done for all kinds of meaningful expressions. But Brandom does not continue this research programme by adding further lists of expres­sions and giving lists of rules for their correct use. He seems to recognise Wittgenstein’s view that there is an indefinite multiplicity of language uses that cannot be fixed in a linguistic theory. No list of definite and limited sets of rules can catch the variety of practices and language games. While Speech Act Theory and Dialogical Logic try to fix the rules of pieces of linguistic practice, Brandom operates on a different level: He tries to clarify what it means to make implicit rules explicit and how this language game of making it explicit can be described by means of his normative terminology. At the same time he asks what meaning and linguistic content is and how meaning is dependent from social practices of reasoning, i.e. from the game of giving and asking for reasons. He does not commit himself to any set of rules that definitly determines the meaning of whatever kind of expression. He is not even obliged to claim that there are such sets. His idea is that talking about meaning and content of linguistic expressions means making explicit the rules that are implicit in inferential language use. The normative vocabulary of commitment and entitlement is designed to articulate these rules as social practices. But these rules do not exist independent from agreements in judgement among the participants of the game of giving and asking for reasons. The picture, given by Brandom, is roughly this: There is a variety of, say ‘flat’ practices and language games in which we participate by following the implicit rules. As soon as the implicit rules are called into question and are made explicit, we enter another game, a multi-dimensional language game of giving and asking for reasons. In other words: we participate in argumentative prac­tice. The turn from mere participation in a practice to arguing about that practice includes a shift of level. But if we try to explicate the rules of this game of giving and asking for reasons – and this is what we do in argumenta­tion theory – we do not leave argumentative practice and enter another higher-level game; we are still participating in the game we are reflecting on. We do not shift the level, but move in a certain direction on the same level. According to this picture, I would say, argumentation theory is an intrinsic part of argumentative practice. It continues argumentative prac­tice in a particular way, but it does not follow rules different from the rules it reflects on. 1. We may distinguish two kinds of practices or games. There is one kind of games in which judging rules and moves, and reasoning about their correct­ness, is itself not a move within that game. Trying to score goals belongs to playing soccer, but discussing these moves does not belong to this game. It is another game to talk and reason about the moves of a game. In these cases we say that playing the game is object-level, while discussing the game is meta-level. Here, we have a fairly clear separation of the levels of theory and practice. But there are games, in which both, performing moves and dis­cus­sing these moves, belong to the same game. With respect to such games it does not make sense to separate an “object-game” from a meta-level game. Shifting to meta-level operations here does not mean to leave the game and play another one, but to continue the game in a certain way. The language game of giving and asking for reasons is of this second kind. Giving and asking for reasons is performing argumentative acts. It is at the same time judging, justifying, attacking or defending these acts explicitly. As participants of this game we are players and scorekeepers at the same time – we play a double role. We have to give up the assumption that there is a strict demarcation line between the level of argumentative practice and the level of argumentation theory. Of course, doing argumentation theory still means to talk and reason about argumentative practice. But to some extent, this always happens already in the game of giving and asking for reasons: If we, for instance, give reasons for rejecting a particular argument, we talk and reason about the validity of this argument. It would be absurd to regard this as a move that would belong to another game, a meta-game. Doing argumentation theory is a theoretical practice insofar as it generally tends to enter the “about”-perspective; it focusses on modelling argumentative discourse, distinguishing types of argument and fallacies, reflecting and developing criteria of argumentative relevance, soundness, adequacy, validity, and so on. But these theoretical activities do not constitute a separate meta-game; they still belong to the game of giving and asking for reasons. As theorists of argumentation we are interested in making explicit the rules of the game, including the rules of scorekeeping in the game. But we are not entitled to occupy the priviledged position of a scorekeeper who judges the moves of the players without himself being one of the players. We remain participants in that game and each of our moves is subjected to the judgements of the other players. All players are also scorekeepers. Emphazising this point, I would suggest to refrain from establishing a theory of argumentation with sets of fixed rules and from claiming that these rules are constitutive for argumentative practice. From the outset, our ‘theories’ are rather suggestions for an understanding of what we do in the dialogical game of giving and asking for reasons. Our proposals are open to critical examina­tion by all participants of the game. We cannot occupy the role of a general judge, a scorekeeper and meta-scorekeeper, a scrutinizer whose authority is immune and neutral, since he is not a player. Argumentation theory and analy­sis is part of the game of giving and asking for reasons. Its role in the game is to make the implicit structures of this game more explicit. Instead of separated levels, we have a continuum from argumentative practices to theories of these practices. And in this continuum there is no priviledged position. Questions of meaning and questions of truth, validity or inference are located on two different levels that have to be treated separately. Meanings have to be clearly determined, before the validity of arguments can be judged. If this con­dition is not satisfied, the argumentative discourse as well as the analysis of argumentation will fail. This view entails a practical recommendation for arguers and analysts: Determine the meanings first, and examine the validity of argumentative inference in a second step. The clarification of what an argument means has to be finished, if the examination of the argument’s vali­dity is to make sense. Therefore, the discourse or the analysis has to be interrupted as soon as ambiguities or meaning shifts appear. An intermitting phase of defining or performing “usage declaratives” has to take place, before argumentation can go on. The operations of shaping meanings themselves do not belong to the process of argumentation, but to means of re-establishing constitutive pre-conditions of this process. I call this view the dogma of fixed-meanings. As far as I can see, Inferentialism entails that this dogma is misleading. If we accept the inferentialist approach to meaning, this separation of meaning and inference does not make sense, since examining an argument’s validity is more or less the same as clarifying its meaning. Inferentialism suggests that meanings are determined and reshaped by inferential use. 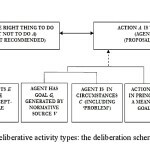 Judging the acceptability of inferences in the game of giving and asking for reasons includes that the parti­cipants implicitely commit themselves to particular usages (i.e. meanings) of the involved expressions. Making these meanings explicit is another inferen­tial move, which entails commitments and entitlements to further inferential moves. In this view, questions of meaning go hand in hand with questions of inferential validity. Neither in practice, nor in theory there is a primacy of the one over the other. Of course, there is still a difference: We may try to make explicit what some expressions mean, i.e. how they are used correctly, or we may focuss on making inferential rules explicit. But this difference is a matter of degree. Both kinds of moving on are cases of making implicit rules explicit. And both have inferen­tial consequences for each other. Shaping meanings of expressions impli­citly determines what can be inferred from theses expressions and accep­ting or rejecting inferences or inference rules contributes to shaping the meanings of the involved expressions. Instead of a methodical order, we have a process that may turn in this or that direction in accordance to the purposes of the players of the game. I would even add that the entire game of giving and asking for reasons, the argumentative discourse would not make sense if we had pre-fixed meanings and inference rules. If that were the case we could simply replace dialogical arguing by monological calculating. 3. Let me now draw a more concrete consequence. It concerns the problem of dealing with enthymems and premiss addition. In the context of understanding, reconstruction and evaluation actual arguments often are said to be incomplete or insufficient. In order to understand the argument, one needs to grasp what is not explicitly said, but implicitly presupposed. In happy cases, back­ground-knowledge, contextual factors, linguistic competence and a charitable attitude are sufficient to understand what is meant. However, there are also unhappy cases in which the addressee mis­under­stands the argument or where the argu­ments really are poor or fallacious – such that even implicit additions could not improve them. In argumentation theory we find the following method of dealing with this problem. There are theoretical models that deliver criteria and patterns for valid and fallacious arguments. Applying these criteria and patterns, we often find the actual arguments not satisfying the conditions of valid inference. Now, we may compare our patterns with what is said and see which pattern fits best to the given argument. Applying the Principle of Charity, we try to identify the actual argument as fitting to some valid argument pattern. This pattern, then, shows us what is missing in the actually expressed argu­ment. We may add the missing pieces and links and reconstruct the argument as actualizing a valid argument pattern. By using this ‘charitable’ method we are entitled to regard the author of the argument as committed to the added premisses. Such a method has, for instance, been proposed by Susanne Gerritsen. If the “original enthymematic argument is in its present form formally invalid and therefore seems to violate the rule that language users should not perform pointless speech acts”, the Principle of Communica­tion (which is the pragma-dialectical version of the Principle of Charity) requires that “a statement must be added that renders the argument deductively valid” (Gerritsen 1994, 42). According to Gerritsen, this addition “is aimed at determining the speaker’s commitments” (Gerritsen 1994, 41). So, “The supplied unexpressed premiss is regarded as part of the original argument, and the evaluation of the unex­pressed premiss is pertinent to the evaluation of the argument” (Gerritsen 1994, 43). According to some proponents of this method of premiss addition, this very method which is explicitly employed in argumentation theory is also what, in happy cases, arguers implicitly perform. The listener is entitled not only to ascribe the added claim to the speaker. He is right in regarding the speaker as committed to that claim. Viewed from the perspective of Inferen­tialism, we may see what’s going wrong, here. The first point is that the pro­cedure presupposes already fixed criteria or patterns of valid inference being in power, independent from the explicit recognition of these criteria by the parti­cipants of the game of reasoning. But inferential rules do not exist in a kind of platonistic realm of eternal ideas to which the theorist has priviledged access. Inferential rules or patterns of argument are proposals to articulate what is already implicitly accepted in the practice of inferring. The fixation of such rules is a kind of technical device that has to be justified and acknowledged by the participants as a helpful convention for their reasoning purposes. The use and justification of criteria of validity belongs to the game of giving and asking for reasons, a game that stands for itself without external theoretical regulation. A second assumtion underlying the ‘method’ of premiss addition and ascrip­­­tion is that the allegedly given crite­ria of inferential validity are at the disposal of the listener or analyst and can be used to ascribe commitments to the speaker. Whether the speaker acknowledges these criteria or commitment seems to play no role. In terms of Brandom’s normative pragmatics, it is presupposed that the addressee or analyst of an argument which seems to him incomplete is not only entitled to add what he is missing, but that the author of the argument is, then, committed to the added claim, since according to the fixed set of inference rules the added claim must have been meant implicitly. But this arbitrary and, I would say paternalistic, ascription of commitment reveals that the argumentation theorist who adopts this method of premiss addition does not see himself as an equally entitled participant in the game of giving and asking for reasons, but as a scorekeeper who himself is not being judged by the other players. In the game of giving and asking for reasons the arguer would also be entitled to ask for reasons for the proposed addition and he may reject the given reasons. By adding a premiss the interlocutor rather commits himself to a particular reading of the argument. He may be entitled to do that, but he is not entitled to commit the author of the argument to that reading. The author is entitled to refuse to accept the addition and thereby shift the burden of commitment to the interlocutor. Seen in this way, premiss addition is not simply a charitable operation, but the continuation of the game in a way which could best be regarded as a proposal for understanding the argument, but not as a fixation of a commitment of the argument’s author. I conclude that Inferentialism is a challenge for argumentation theory. It suggests that we should give up the enterprise of looking for the best theory of argumentation which may regulate and, thereby, improve argumentative prac­tice. The game of giving and asking for reasons stands for itself. If we wish to contribute to the improvement of this practice, the only thing we can do is participating in this practice in such a way that the implicit is made more explicit. Brandom, R. B. (1994). Making It Explicit. Reasoning, Representing and Discursive Commitment. Harvard University Press. Brandom, R. B. (1997). Précis of Making It Explicit. Philosophy and Phenomenological Research Vol. LVII. 153-156. Brandom, R. B. (2000). Articulating Reason. An Introduction to Inferen­tia­lism. Harvard University Press. Gerritsen, S. (1994). A Defence of Deductivism in Reconstructing Unex­pres­sed Premisses. In: F.H. van Eemeren & R. Grootendorst (Eds. ), Studies in Pragma-Dialectics, Amsterdam: SicSat. Govier, T. (1987). Problems in Argument Analysis and Evaluation. Dord­recht: Foris. Lueken, G.-L. (1999). Prämissenergänzung. Dialektik 1999/1. 95-113. ISSA Proceedings 1998 – What Makes The Reductio Ad Absurdum An Important Tool For Rationality?